On AMC‘s The Walking Dead midseason finale, we check in with all our survivors. This leads to an occasionally-fragmented episode that really comes together at the end. Let’s start with Maggie, Sasha, and Enid. The people of the Hilltop look to Sasha and Maggie as heroes, something which annoys the hell out of Gregory. One guy made them an apple pie, and his daughter thinks that Maggie should run for “president” of the Hilltop. While Maggie is out getting milk, Enid confronts Sasha: she lied to Maggie, telling her Jesus was still here, when he actually left the day before. Sasha admits she needs to do something, and Maggie will want to help. She wants to kill Negan, needs to kill Negan. Enid suggests that Maggie wouldn’t mind if she had help, and Sasha reiterates that she needs to keep Maggie and Enid safe. Daryl finally decides to leave his cell. He darts through the halls, careful to avoid people. Ducking into a room, he finds clean clothes and a jar of peanut butter. He grabs a pipe as a weapon and makes his way outside, where the motorcycles are parked. As he rushes to his bike, Fat Joe wanders out, eating a sandwich. He gets scared when he sees Daryl, puts his hands up and swears not to say a word – Daryl can just go. “I’m just trying to get by,” he insists. Daryl doesn’t buy it, and he beats Joe to death with his pipe. He grabs Joe’s gun. “It’s not just about getting by here,” he grunts. “It’s about getting it all.” Jesus, his mystery savior, appears and the two jump on the bike. Carol is reading peacefully by the fire in her cozy hermit house. She notices through the window a package sitting on her porch and finds Morgan sneaking away. He was just bringing her some fresh produce which annoys her. Ezekiel already brought her some supplies, and Carol again insists that she wants to be left alone. She asks how he is; Morgan says he is good. “Good. Leave now,” Carol says. This is her gentle teasing, but Morgan does leave – or is about to. Richard is at the door, and he wants to talk to both of them. Ezekiel was greeted by the Saviors in the woods one day, and he cut a deal. Very few people of the Kingdom even know about the deal. Things are peaceful, and the Saviors promised never to set foot in the Kingdom as long as they make their drops. Richard worries that things could turn at any time, and the Kingdom will fall. He knows Ezekiel trusts Carol and Morgan, and he wants them to convince Ezekiel to attack the Saviors. 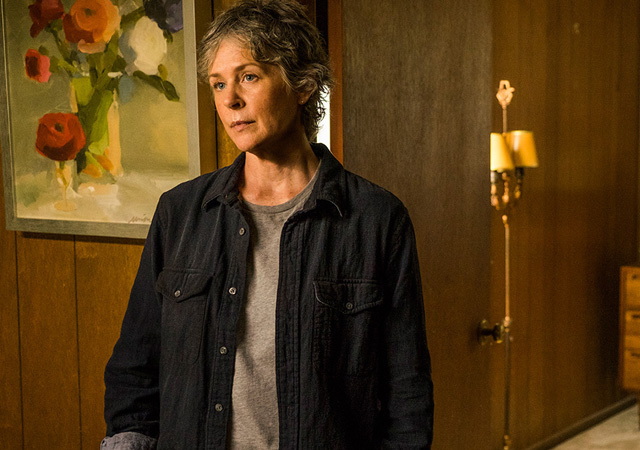 Both Carol and Morgan refuse to fight; Richard just wants them to convince Ezekiel to fight. But neither of them want anything to do with the Kingdom, their lives – or their deaths. Richard storms out, promising that things will turn one day, and blood will be on their hands. Carol insists that Morgan go, never come back, and to not tell anyone where she is. Richard goes to an RV hidden deep in the woods, and cries. Michonne is still driving with the Saviorette, keeping the gun pointed at her. She refuses to answer any of Michonne’s questions, so Michonne fills the silence. She’s not going to kill Negan today, but she’s going to find a way to beat him, to change this, “for me.” Eventually the Saviorette stops the car a mile down the road from what looks like an enormous community. “We are all Negan. Whatever you are trying to do. You can’t.” The Saviorette challenges Michonne to go home, to kill her, to do whatever it is she is going to do. The car makes a U-turn and drives back the way it came, both women still inside. 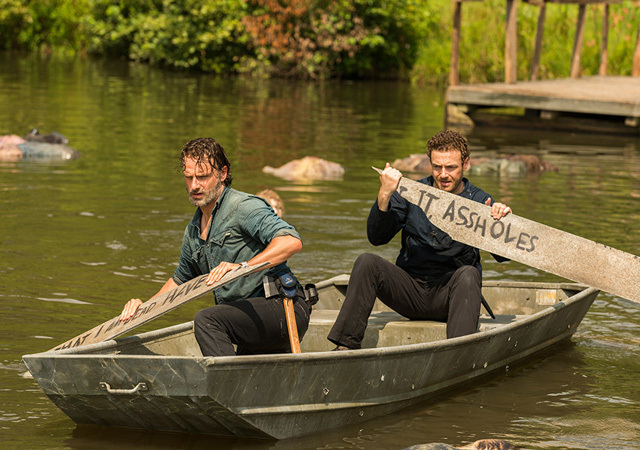 Rick and Aaron decide the boat, full of bullet holes, should take them halfway across the lake until they can get in a canoe that will take them the rest of the way to the houseboat. Using some broken boards as oars, they head out. They are almost at the canoe when zombies start to attack. They beat the hell out of the zombies – including one that looks exactly like Robert Kirkman. They make it to the canoe, but they find a zombie hiding beneath some life vests. Rick kills it and climbs aboard the canoe, but Aaron is dragged overboard and under the water. Rick looks out across the lake, for any sign of Aaron, paralyzed by fear and uncertainty. Aaron finally resurfaces and promises he is okay. They meet on the deck of the houseboat where they take a minute to rest among a carpet of spent bullet shells. Inside the houseboat, they see no ammo, but find lots of other supplies. They also found a note with a drawing of a middle finger, and the message “You win, but you still lose.” Aaron is perplexed by this note and packs it up with the supplies when they get back to the truck. As they pack the truck, someone watches them from the far side of the lake. 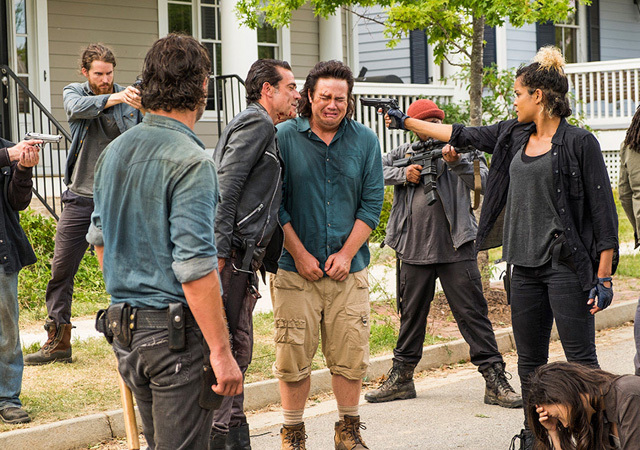 Eugene returns to Alexandria in shock, injured, and not happy. Spencer is going over the goodies with a couple of Saviors. A blonde girl with a huge neck tattoo flirts with him and suggests that if he plays his cards right, she will show him where she lives and even buy him a sandwich. Spencer returns home and finds the place trash. He cleans up, then cleans himself up and practices saying “Hi” in the mirror. It is a total sociopath move. Rosita is talking with Gabriel about her bullet, and how she plans to kill Negan with it. Gabriel warns her that Negan will kill her, but Rosita doesn’t care – as long as he dies, too. She clearly has a death wish in order to avenge the murders of Abraham and Glenn. Gabriel agrees that Negan needs to die, but suggests that she wait for the right moment, or create it together. Either way, she is part of that together, and they need her. Negan has made himself at home at Rick’s house. He shaves. He cooks dinner for his “family,” while Carl bakes. Tara brings some lemonade to Olivia, who is waiting outside, crying and trying to work up the nerve to go back in there. Tara offers to go, but Olivia insists it is her job – she promised Rick she would keep Judith safe. Carl sets the table, Negan at the head, with Olivia holding a sleeping Judith. A big beautiful meal is waiting for them, but Negan is waiting for Rick. Rick is taking too long, and he decides not to wait anymore. Lucille is hungry and he puts his bat in Rick’s seat. Spencer leaves his house with a bottle of whiskey. On his way down the street, he sees Rosita, sitting on her porch, contemplating. Spencer tells her he feels he is on a “good momentum” with the Saviors and is going to try to get closer. It may take months, or even years, but it is the way his mother would have handled things. He then asks why Rosita ended their relationship, and she admits she used him – and is sorry. He asks her to dinner that night – no strings. She agrees. Spencer continues on, but he is not going to see the blonde Savior; instead he is going to see Negan. Arat, one of his guards, blocks the way, but Negan insists she stand down. The two men drink whiskey on the porch. It is idyllic, and Negan decides he is getting a “summer house” here. The only thing missing is a pool table. Spencer points to a house that has a pool table inside. “You might be my new best friend,” Negan enthuses, but decides it is too nice a day to spend inside. Magically, the Saviors set up the pool table in the middle of the street. The two men play, and Spencer wants to talk to him about Rick. Spencer tells Negan that Rick tends not to work well with others. His family died shortly after Rick showed up, and Negan suggests it is a good thing he isn’t in control anymore. “His ego is out of control,” Spencer counters. He beats around the bush, suggesting that he can be the leader his mom was, and that everyone would be better off if Negan put Spencer in charge. Negan does not take kindly to this suggestion. “Rick hates my guts, but he is out there gathering to make sure I don’t hurt anyone else. He is swallowing his guts and getting sh*t done. That takes guts,” Negan informs Spencer. On the other hand, he doesn’t like the sneaky way Spencer waited until Rick was gone to come ask Negan to kill him and install Spencer as Alexandria’s new leader. “Why don’t you just kill him yourself? I guess it’s because you’ve got no guts,” Negan says – then jams his knife into Spencer’s belly, ripping it open and letting out a tidal wave of blood and intestines. A crowd has formed, and everyone freezes in horror as Spencer crumbles to the ground. “There are your guts! I’ve never been so wrong,” Negan admits. He then asks someone to clean up this mess, but everyone is too shocked to move. 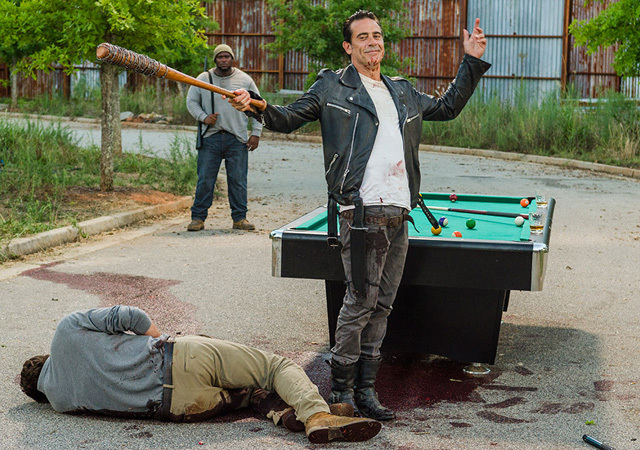 Negan asks if anyone wants to finish the pool game. The nonchalance snaps Rosita into action. She aims her gun and fires. Rick and Aaron hear the gun, and they rush towards the sound. The bullet hit Lucille, not Negan, but Negan flips out and Arat knocks Rosita to the ground, a knife to her throat. Negan is fascinated when he realizes the bullet is homemade. Arat moves her knife to Rosita’s cheek, and threatens to mess up her face if she doesn’t tell him who made it. Rosita claims it was her and Negan thinks she is lying. Rosita again claims it was her, and Arat cuts her face a little bit. Negan gives Arat the go-ahead to kill anyone she wants. She whips around with her gun and shoots Olivia through the eye. Rick shows up, screaming that they had an agreement. Negan points out that he has bent over backwards to show Rick respect: he took Carl home (and “I fed him spaghetti!”) and he killed Spencer because Spencer wanted to kill Rick. Negan goes back to questioning the crowd about who made the bullet, and Tara insists she made it. Eugene comes forward too, and when he starts rattling off the recipe, Negan realizes it is Eugene he wants. Negan is taking Eugene back with him, along with all the supplies they found today. 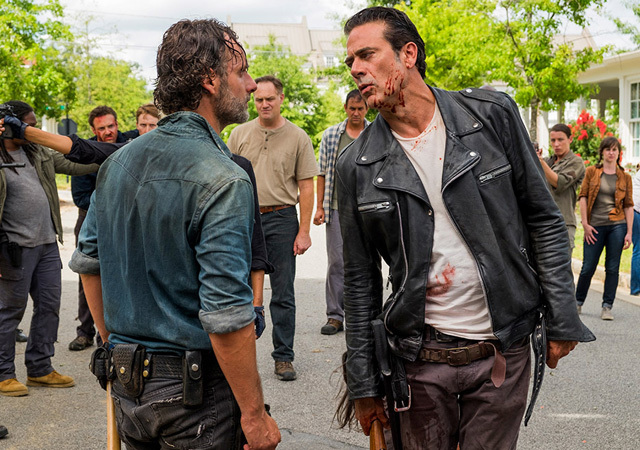 But Negan is sure to point out that it’s “still not enough.” The Saviors move out, and the rest of the Alexandrians go home, leaving Rick to take care of the zombified Spencer. Later that night, Rick has the middle finger note in the jail cell. He is just thinking. Michonne finds him and tells him she found what she was looking for. She realized she didn’t want it to be her way; she wanted it to be our way. Michonne warns Rick that there are more Saviors than they realized, and they would be seriously outnumbered. “But we are still alive,” she points out. That is why they have to fight. They can find a way to beat them, but only if they do it together. Rick knows this now. It is morning, and Maggie does her usual visit to Glenn’s grave, then taking her position atop the wall. She sees something, and yells for Sasha and Enid. Rick, Michonne, Tara, Carl, and Rosita are at the gate. It is a wonderful, moving reunion, and Rick tells Maggie she was right from the start. She said get ready to fight, and he didn’t listen; couldn’t listen. He is ready now. Daryl comes out from behind a building and he and Rick hug tightly, crying. Even Rosita and Sasha nod and smile at each other – respect. 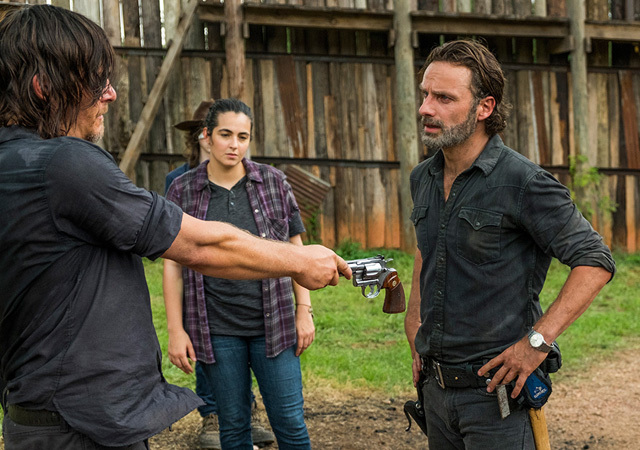 Daryl hands Rick the gun he took from Fat Joe, and Rick accepts it. He has his fight back. Rick leads his group of warriors up to the main house. They have a war to plan. As a post-script, there is someone watching Alexandria at night, with binoculars. Maybe the person from the lake? You can watch the promo for the second half of The Walking Dead Season 7 by clicking here.